Ayurveda is one of the world's oldest holistic healing systems, originated about 3000 years ago in India. Ayurveda is not simply a healing system, but it is a way of life. The essence of Ayurveda is to keep the delicate balance between the body, mind and soul. Its purpose is to find the true balance of life by bringing adequate change in our diet and lifestyle. Kerala can be called as the cradle of authentic Ayurveda practices. Ayurveda in Kerala is having a very suitable atmosphere which hand on its curative and restorative effects to the humanity. The even-tempered climate and the unique monsoon with almost uniform humidity makes it the ideal place for natural medicines to work at their highest levels of potency. The land is also blessed with affluent forest wealth having plenty of medicinal plants and herbs. This is a boon to Ayurveda in Kerala since it provide a continuous reliable supply of Ayurvedic medicines with uniform potency throughout all seasons. Thus Kerala with its ideal topographical setting and auspicious climate has made the purification and rejuvenation therapies most effective for the wellness of human body. The primary aim of Ayurveda is to maintain the health of healthy people and to cure the diseases of sick people. Principally it comprises of 2 parts – cleansing therapy and pacifying therapy. When the toxins of the body causing diseases are in lesser quantity, pacifying medicines are given both internally and externally. Cleansing therapy which include the Panchakarmas of Ayurveda are used when the toxins are in greater quantity, thus draining them out from the body through the natural orifices. Ayurveda Panchakarma includes specially designed five procedures of internal purification and detoxification of the body through the nearest possible route. Such purification allows the biological system to return to homeostasis and to rejuvenate rapidly and also facilitates the desired pharmaco-therapeutic effects of medicines administered thereafter. As a treatment procedure, Panchakarma has different roles - application in the treatment of disease, as preparatory measures before surgery in Ayurveda, before administration of Rasayana and Vajikarana therapy etc. But today, Panchakarma expounded in Ayurveda is perhaps the most misunderstood of all Ayurveda practices. Due to ignorance, it is often perceived as just another system of oil massage. Panchakarma is not only good for alleviating the disease but is also a useful modality of treatment in preserving and promoting the perfect health. Panchakarma with wider range of therapeutical effects will pave way to nourishment of tissues, rejuvenation, increasing virility etc. In today's busy world more and more people are becoming victims of the adverse effects of stress and anxiety, which is leading to diseases like gastro-intestinal disorders, lack of sleep, allergies, heart diseases, diabetes, cancer, osteoporosis, chronic fatigue etc. These diseases caused mainly due to deep seated metabolic toxins. Panchakarma eliminates these metabolic toxins from the body allowing permanent healing of tissues and channels. Panchakarma well known as detoxification and rejuvenation therapy, helps to eliminate the disease causing toxins and revitalizes the tissues. Panchakarma has a full therapy role as preventive and curative procedure. 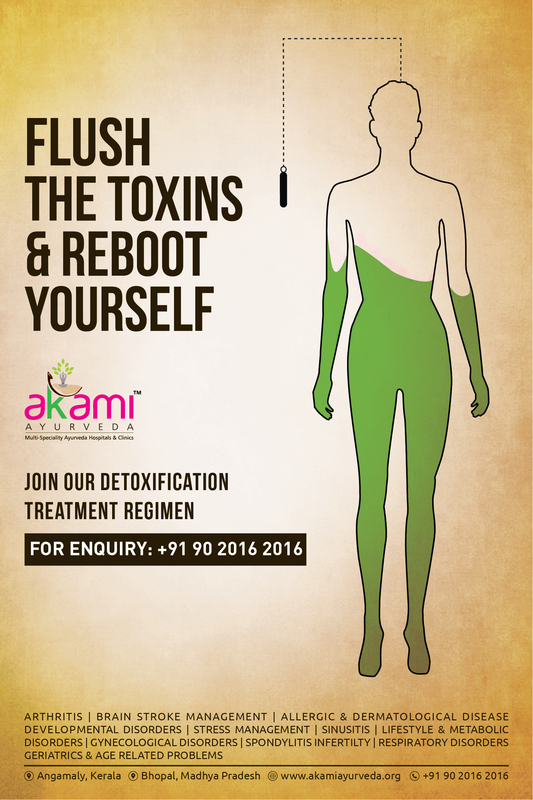 We welcome you all to join the detoxification regimen in AKAMI and enjoy the goodness of Ayurveda. We offer authentic Panchakarma and Kerala special Ayurveda treatments performed by professionally qualified and experienced therapists under the guidance of proficient and specialist doctors. Appropriate clinical examination of the patients will be carried out and the treatment protocol will be planned by the doctors after considering the physical and mental health of each individual.